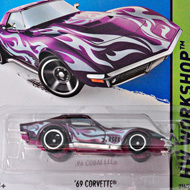 209/250 is part of the HW Workshop series and the 2014 Super Treasure Hunt set. 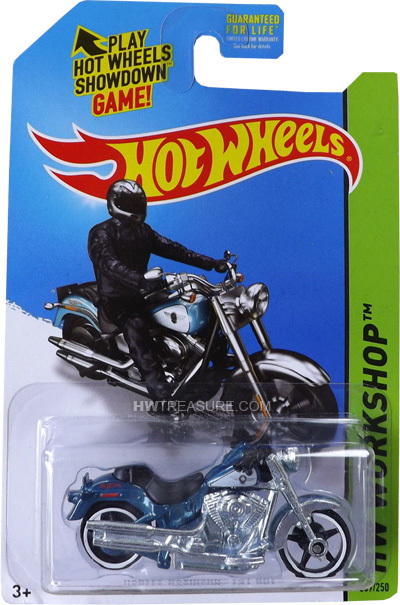 The Spectraflame blue motorcycle has a Harley-Davidson logo on the tank and a red hot Wheels logo on the sides. 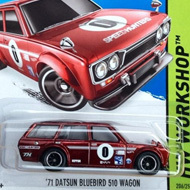 It features MC5 Real Rider wheels with black spokes & white rims, and an unpainted metal Malaysia base. The Harley made its debut in the 2012 New Models series and is based upon the bike of the same name. The Fat Boy boasts fat handlebars, fat tank, fat wheels, and a fat fender reminiscent of choppers from the ’60s and ’70s.